Stitchers Anon: Yummy Monday's freebie! Hello sweet ladies (and gents if there are any). Did you have a good weekend? I had a lovely time but it wasn't as productive as I hoped as we entertained family. The latest Holmsey is nearly finished though I stopped after stitching his bottom last night. I think I might have to have a quiet and tactful word with our poor little hare about his diet and how much he seems to be eating at the moment. If his bottom was smaller then I could stitch it faster! So as April promise to rush by as quickly March did, I really must get my own bottom into gear and get on with things. A busy week is promised. Tuesday is a hospital visit but it is a nice early appointment so I'm hoping to get to Galway's craft shops and stock up in quilting pins and needles which seem to just disappear into thin air. Nobodys toes have found any for me lately! Wednesday is parent's meetings at son's school. Not too sure how worried I should be? My youngest is a 'character'! Sunday I have a meeting which promises wonderful things but I want to keep that secret until I know a little more..and inbetween I want to start some crochet, cut some fabric, sew a little and finish Holmsey as well as plant some veggies! Oh yes..so many, many things I want to accomplish! busy busy busy!! The sun seems to be everywhere apart from here in southern England!! Enjoy the sun, its lovely here in the rain too! Awe chicks.. they must be lovely to watch. I hope your meeting Sunday goes well and all the good things happen. Parents evening .. I always felt like it was me, the parent, they were not impressed with if something was amiss!! Happy seed sowing, so pleased you have some sunshine - you've sent your rain here lol. 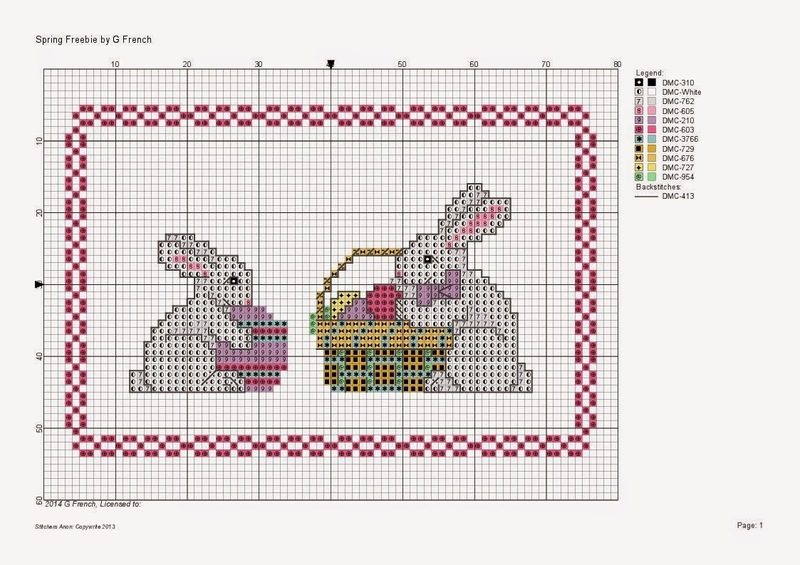 Very cute bunny chart ... thank you : ) For some reason I didn't know (or didn't remember) that you are in Ireland! Send us some Irish sunshine!!! It's constant showers here in Shropshire!! Your latest chart is very sweet, well done! Such a cute freebie! Thank you! What a gorgeous freebie. Thank you! Glad you are having some sun, but you forgot to share it with us! Thanks for the seasonal freebie. I've added it to my themed list of links!